Salam. Inshallah I hope to be travelling soon, and may not get a chance to update the series of biographies of Indian hadith scholars we have been posting recently. The aim of the series was to make mention of those ulema who came after Shah Waliullah but before the solidifying of the Barelwi/Deobandi/Ahl al-Hadith split in the Indian Subcontinent. Its is accepted that all three of the aforementioned schools trace back their isnad in hadith to Shah Waliullah al-Dehlawi. Inshallah I hope to discuss this further in more detail in the future. 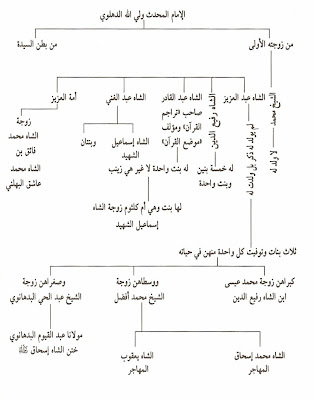 I found the above family tree in the thabat of Dr Taqi al-Din al-Nadwi (p.74), it consists of a diagram respresenting the scholarly descendants of Shah Waliullah. When I recently visited Dr Taqi I asked him whether he knew of any family members of Shah Waliullah presently living in India or elsewhere. Dr Taqi answered that he was not aware of any. We ask Allah (the Exalted) to have mercy on all those mentioned in the diagram, and facilitate us to be linked to those mentioned therein even more closely.